The company Ergogenics Nutritition has launched its new vegan dietary supplements. The manufacturer has decided to concentrate exclusively on the production of animal-free and vegan products. Previously, the company produced the Whey Pro series, which enjoyed great popularity but has now been discontinued. The aim of the conversion was to completely eliminate animal ingredients from all the products on offer. This was because no manufacturer had previously made its entire product range vegan. At the time of Ergogenics Nutritition’s market entry, there were already several supplement manufacturers with some vegan products – for example HS Activa – but the demand for purely vegan producers is increasing, and Ergogenics is taking advantage of this. Ricky Mehta, founder of Ergogenics Nutrition, recently commented on the market launch: “It is a big step to choose moral and ethical values and put them above profit maximization, especially in this competitive industry. We would appreciate any contributions from the vegan community”. 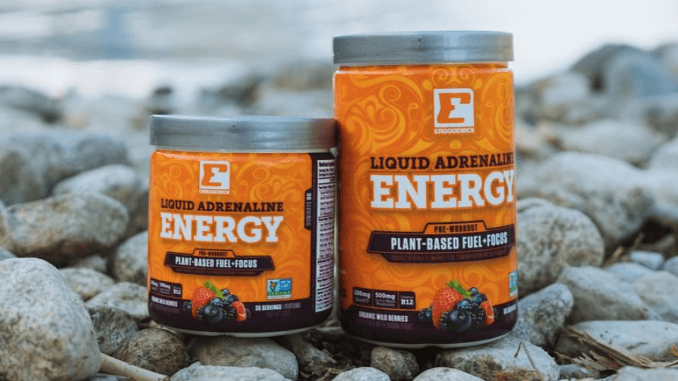 Mehta has started afresh with products such as “New Liquid Adrenaline Energy”. The energizer consists of vegan ingredients such as coconut oil, Lion’s Mane Mushroom, turmeric, ginger & yerba mate. This combination of plant-derived ingredients has a stimulating effect.